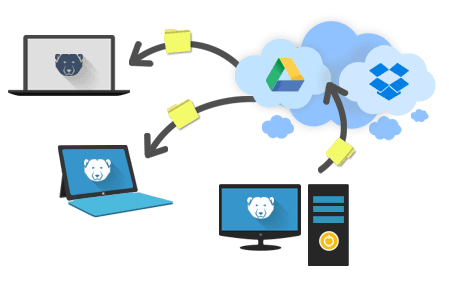 Deep Freeze supports Dropbox and Google Drive. ThawSpace in the cloud to automatically sync critical user data. Critical user data is retained and synced to the cloud while your computer stays protected. ThawSpace in the Cloud: User data is now synced to the cloud. 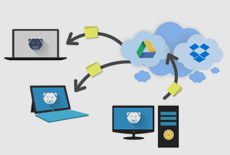 Multiple users using the same computer cannot access each other's Google Drive or Dropbox data. Users no longer need to save data on USB drives resulting in increased security. Data stays on the cloud and is available on any system where users logon. No need to provide network shared folders to users. No need to create ThawSpaces to retain user data. No need to backup user data. The data is automatically synced to the cloud. Synced files are automatically deleted to prevent data theft. My Cloud Drive data is visible to the user. However, it is not downloaded unless the user modifies the file. Once the file is saved, it is synced to the cloud and the local copy is deleted. User data continues to be synced to the respective cloud account even after they logoff or reboot the computer. The cloud data is not downloaded unless a file is accessed by the user.